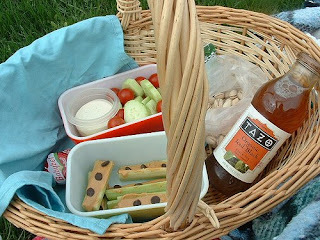 With the weekend, comes the picnic basket shares again. It is pretty amazing when your housemommy texts you and shows up at your doorstep the next minute to share her kitchen efforts, and pretty much outdoes herself each time. She is certainly one resourceful woman who knows how to make Sunday a day of surprises with her little faithful oak brown basket. The lunch menu of the day: a tantalizing mix lightly roasted chicken filets topped with pruscuitto ham and grilled cheese, with yellow and green zucchini slices sprinkled with fresh parmesan cheese on the side; a mixed vegetable salad of chopped onions, sliced radishes, lettuce, cubed tomatoes, parsley and one little green olive; with fresh from the oven orehnjača slices, or otherwise known as walnut roll slices, for dessert. Not to forget, the beverage of the day, a little bottle of fanta orange. The dinner menu of the day: a simple delight of panfried chicken bits with chopped tomatoes, red and yellow paprikas and onions; blitva, which is a little like spinach so guess it can be considered the local version of spinach, with potato chunks, garlic and olive oil; and two bags full of cherries, one red and another that is called rose cherry according to my housemommy; along with a couple of peaches, though unfortunately she chose to throw one as she saw it was a tad dented on the side and thought it bad and better off in the bin. In a way, guess this is, sort of, the way my housemommy tries to make up for all the raucous that has going about. Aside from trying to make sure that am properly fed and showing she cares, guess it is also her way of protecting me of sorts from the streets since it has not been quite so convenient to step out, just in case. Having said that, armed with a decent pair of earphones blasting the music favourites from the trusty old laptop, and a silvery fork and knife, it would so seem, that this little one lives to see, yet again, another day. everytime you write about what your housemommy prepares for you, i imagine you tucking in happily and feel my mouth water! simple things in life can make one happy. although your extensive lunch and dinner menus are anything but!